When we played Octahedron last year, we cited it as a tough, frustrating, yet ultimately rewarding game. And while not much has changed and that’s definitely the same on Nintendo Switch, this is a game that works even better in the palm of your hands. It’s not just the additional content that makes this ‘Transfixed Edition’ all the better. The extra time trials certainly add to your woes, though you are rewarded for that with more end-game content. This just feels like the definitive edition of a wonderfully crafted indie game. Any bugs have been fine-tuned, the gameplay is slick and stylish, the UI feels more responsive. Best of all, Octahedron: Transfixed Edition works masterfully as a handheld game. This has always felt like a game you can drop in and out of when the mood takes and it looks, sounds, and feels as good as any of its counterparts, even on the smaller screen. The use of rhythm to build moving platforms in time to the music, gradually ascending to the top of the level still feels as refreshing in the platforming space as it did when it first launched. And considering this is now sharing a platform with the likes of Donkey Kong Tropical Freeze, Super Mario Odyssey, and Kirby Star Allies, Octahedron still manages to stand shoulder to shoulder with them all. Oh, and don’t forget this was all built by one guy! Octahedron isn’t going to be for everyone. You’ll grit your teeth and pull at your hair. It’s unforgiving and harsh, and it relishes in your misfortune. Yet that small amount of progress you make each time might just be enough to keep you coming back for more. 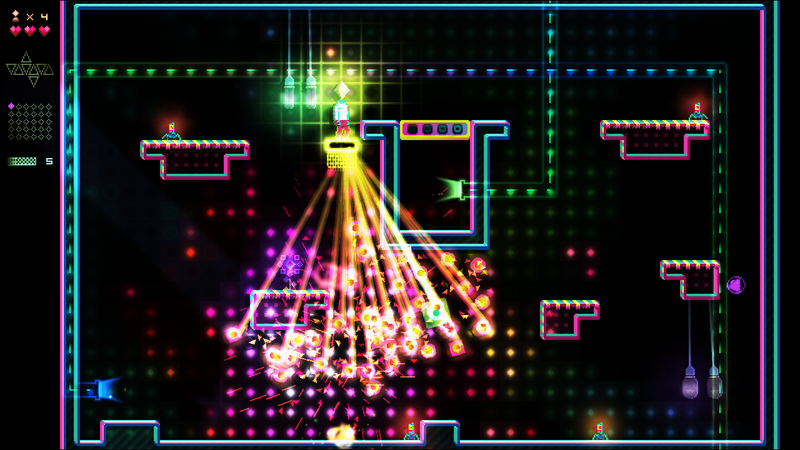 It’s hard to deny the game has a clear hook, it just so happens Octahedron is still entertaining while reeling you in. Some might even compare it to the Dark Souls of platform games. But while you should probably never trust those people, you should definitely trust your gut and add this to your Switch library today. You won’t be sorry.